Description: Sexes similar. 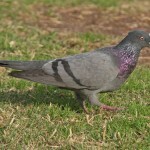 Light brownish gray above, buffy below with a pinkish wash; black spot at lower base of ear patch; black spots on upperwing; and long tapered tail. 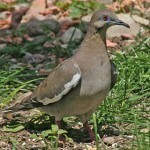 In flight, white tips of outer tail feathers are visible. Juvenile is browner overall with heavy spotting. Habitat: Occurs in a variety of habitats, including open woodlands and edge areas, parks, cities, gardens, and grasslands. Where in Nebraska: Abundant spring and fall migrant and summer resident across the state. Will overwinter in Nebraska if the winter is mild, or in sheltered locations. Also a regular breeder. 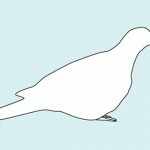 Field Notes: North America’s most abundant and widespread dove. 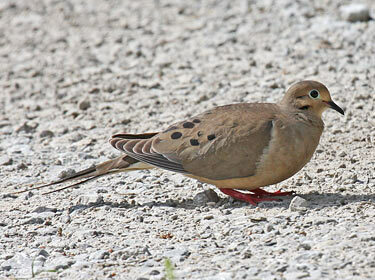 Fun Facts: Mourning Doves feed quickly on the ground storing seeds in their crop and then fly to a perch to then eat the seeds in safety.